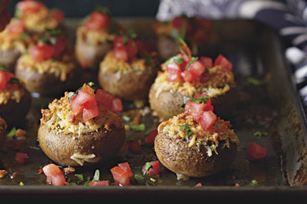 Bring a creamy, savory appetizer to your next potluck with this Little Stuffed Mushrooms Recipe. Panko seasoning, rosemary & garlic Parmesan and plum tomatoes give lots of added flavor to this mushrooms recipe. Combine coating mix, cheeses and seasonings. Remove and discard stems from mushrooms. Place caps, top sides down, on baking sheet sprayed with cooking spray; fill with cheese mixture. Bake 20 min. or until heated through. Top with tomatoes. We revised this recipe to use KRAFT Shredded Cheese, SHAKE 'N BAKE Coating Mix and seasonings. Our Kraft Kitchens team has developed substitutions for the entire FRESH TAKE lineup so that you can continue to enjoy the great taste of these products. Click here for our Rosemary Roasted Garlic substitution guide. To make more room in the mushroom caps for stuffing, remove the mushroom stems, then use the small end of a melon baller to scoop a little extra mushroom flesh from the bottom side of each cap.